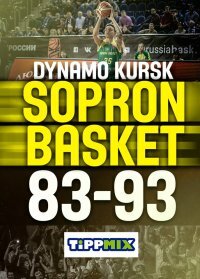 After leading almost through the entire regulation we managed to ruin Dynamo Kursk's unbeaten record on their home court in overtime! 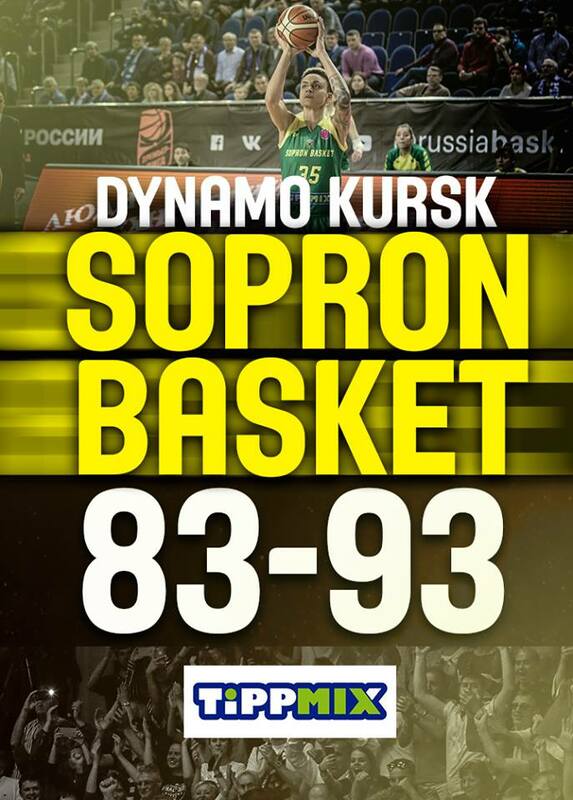 Dynamo Kursk - Sopron Basket 83-93 (17-13, 18-22, 18-21, 21-18, 9-19) o.t. The home team got the first basket in the game for two, to which Aleks answered back with a triple. Then Candice and Prince exchanged baskets, to which Queralt addded two more (2nd minute 4-7). In the low-scoring first quarter we were always a step ahead of the hosts, but we couldn't build up a confortable advantage (7th minute 10-12). What's more, Kursk were even able to tie it up, and then take the lead, forcing our first time-out in the game at the end of a 7-0 run (14-12). We had our chances to get back on the front foot again, but instead Stewart buried a three to pull further away. The first period ended with our returnee, Kata drawing a shooting foul, and then she converted one of two shots from the free throw line to slightly cut into our deficit (10th minute 17-13). The second quarter began with Kata handing out an assist to Aleks, and then Aleks giving one to Tina for the equalizing basket. Then Prince and Debi exchanged baskets, and then our shooting guard gave us the lead back (14th minute 19-21). Then Tina increased our lead further from under the rim, to which Prince answered back with a double of her own. Howard drew a foul on Debi, but before she could stand behind the line Lucas Mondelo called a time-out to talk things over. Howard made on eof two from the line afterwards. Then Yvonne made both from the line, and after that she hit a demoralizing triple (17th minute 22-28)! Candice added a double to our total, to which Howard answered back with a double, and then came Yvonne again with yet another huge shot from downtown! After that Kursk came up with a 5-0 un to come back closer to us, forcing our second time-out (29-33). When the teams came back from the short pause Candice beat her defender under the rim for two, to which Howard answered back with two quick baskets. The final say in the quarter was Cruz's, she beat the buzzer for two with a nice jumper to tie the game back up again (20th minute 35-35). Tina got us going in the second half with a lay-up, to which Howard answered back with a three-point play, and then Hollingsworth had an attempt to do the same but missed the free throw. Then Candice hit one from mid-range reducing the gap to one (22nd minute 40-39). After that Kursk made three foul shots in a row to pull away, but then Amanda and Candice also hit field goals, followed by an unsportsmanlike foul drawn by Yvonne. Our guard hit both shots from the line and then Amanda drew a foul on the next possession, and converted both shots awarded (43-47)! Prince and Amanda exchanged baskets, and when the home team forced a shot clock violation they called a time-out (26th minute 45-49). After the break Candice made a lay-up to push her team further ahead, to which Cruz answered back likewise. Stewart missed one of two from the line, and then Aleks buried a huge three at the other end (28th minute 48-54). Kursk performed a 5-0 run to get back up on our necks, but we had the final say, which meant that we were in the lead going into the final stage of the game (30th minute 53-56)! Tina began the last period with a free throw, to which Cruz answered back with a double. Then Candice made one from the paint, followed by a double by Howard. After that both sides stepped up on defense, hence a seemingly long scoring drought, which was ended by a free throw from Howard, and then Queralt made a lay-up on the other end, to which she added another one in the next possession. After that Yvonne drew another unsportsmanlike foul, giving her two attempts at the line, out of which she made one, and then from the next possession Candice made a double, increasing our lead all the way up to eight points with four minutes remaining on the clock (36th minute 58-66)! It was also her in the next possession who scored for a double-digit advantage for the first time in the game (58-68)! Then we managed to score again, but after that Kursk came up with a 6-0 run to cut their deficit in half and then after an unsuccessful offense they called a time-out, because Candice was awarded two shots from the line (64-72). She missed both attempts, and Prince made a double from inside the paint at the other end, and so did Howard, forcing our next time-out in the game (68-72). After that Prince made one of two from the line, and Stewart grabbed the offensive rebound and put it back for two, one-point game (71-72)! Yvonne made two free throws to give us a three-point lead, but then Prince hit a big three to tie the game up and force overtime (40th minute 74-74)! The extra time began with a lay-up by Amanda, and then Kursk committed an offensive foul, giving us another chance to score, which was well taken by Aleks, before Stewart scored the first two points for the home side (42nd minute 76-78). Then Queralt made a double to push Kursk away from us again, to which Stewart answered back with a three. Aleks did the same thing at the other end! Kursk made one from the line, to which Candice answered back from mid-range, and then Yvonne ran down the court for a lay-up forcing Kursk's next time-out (44th minute 80-87)! Cruz hit one from downtown after the break, to which we answered back with a 6-0 run in the end which means that we are the first team to beat Kursk this season in the Euroleague (45th minute 83-93)! Roberto Iniguez: We respect Kursk. They have been unbeaten so far, but we know that it isn't easy to win every game. If you are very strong, everyone will think that you can beat anyone. However, it's not that easy. I am extremely proud of the team! We lost the last two games by nuances, but now we got something back, we deserved to win! Especially being able to bounce back in overtime after falling short in the last minutes of regulation. We will keep working! It is a valuable win, but it's more about what you feel when you see your team perform like this. We are working with a lot of young players, who, of course, make mistakes, but they learn a lot from these games! I am proud of them! Candice Dupree: We played a very good game! We were facing a team with an unbeaten record, without any pressure. The last minutes of the fourth quarter were very difficult, but we stayed strong for overtime thanks to a great team effort.